I read a few blogs that cover a wide variety of topics. One sewing blog I read is Erin's "A Dress A Day" (a dress. mostly every day). Erin is a seamstress and she sews garments. Mostly she shows dresses (always dresses! always with pockets!) that she has made for herself (if she sews for others, I'm not aware of it). And she has the most eclectic taste in fabrics. Emails between us ensued (some of them from me of the Great American Email variety) and we came to an agreement about the size, layout, colors, timeframe and cost of a quilt. Initially, the agreement was that she would send me a boatload of scraps and I would piece a top for her. 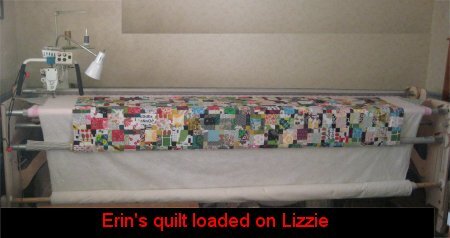 At that time, my skills with my Tin Lizzie longarm quilting machine weren't too competent and I was up-front about this with her. However, as in all things, Life Got in the Way ... for both of us. Since this quilt wasn't being made for a specific event nor did it have a hard deadline, slipping the dates was agreeable. It wasn't until several months later that Erin was finally able to go through her scraps and box them up for me. She mentioned to me that her procedure was to (paraphrasing) " .. find a scrap, throw it in the box. Repeat until box is full. Find another box. Repeat." Eventually I received 3 (!) BIG boxes stuffed to the gunwales with fabric. As any fabriholic will attest, being able to fondle fabric is an aphrodesiac. And while you can traipse down memory lane with your own scraps, being able to fondle NEW scraps that you will be working with is near ecstacy. At least it was for me. :-) The downside was that Erin was not kidding when she said she was literally throwing the fabric into the boxes .... they arrived stuffed and crammed and very wrinkled. From all the design ideas I had sent to her for consideration, she decided on the Disappearing 9 Patch block, as this was a new variation and would enable quilt historians to easily place this quilt on a timeline of quilt evolution. (A history of the Disappearing 9 Patch is below). Once that decision had been made, I sent her links for many, many different layouts and color placements. None held her interest until BAM! ... she saw the random color quilt. That was *it*. She specified absolutely no color placement, no pattern, no nothing. Completely random. I knew I was Doomed. I don't do random. I like Organization. Symmetry. Pattern. Repetion. Planned placement. It all comes from being a computer programmer and all the schooling that comes with it. Us geeks are anally-retentive that way. :-) BUT ... this quilt wasn't mine and it didn't matter squat that random isn't my cup of tea. I know my problem with random is, well .. it's random. There are no rules. 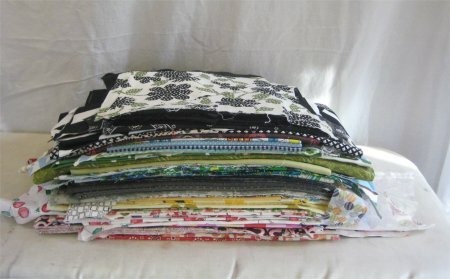 I have tried making random fabric quilts before and ended up micro-managing my fabric placements anyway. It's all very frustrating. However, as my kids know, I do not like problems; I like solutions. Therefore a solution was found: Mr. Pirate created a random number generator for me for each block. For Erin's quilt, I would need to make 143 blocks. 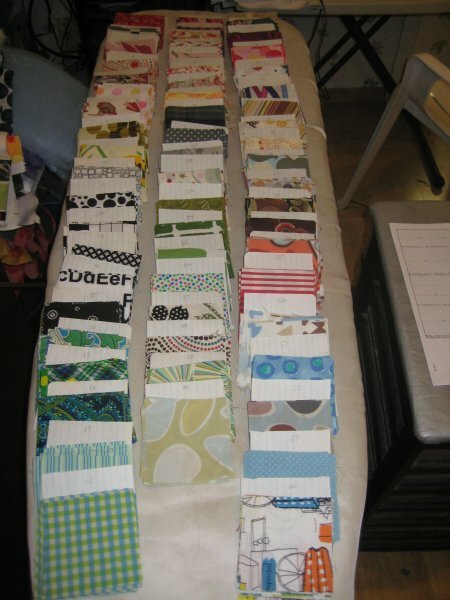 Each block was made from 9 different squares (cut at 3-1/2") and I had 60 fabrics to choose from. After I cut squares from all the fabrics I was going to use, I stuck a number label on each pile. This number corresponded to the number on the spreadsheet for that block. If a number was replicated within a block (after all, if it's a RANDOM number being generated, there will be occasions where numbers will be duplicated), even *I* could handle making a substitution. :-) The overall angst resulting from choosing 9 different fabrics for all 143 blocks just disappeared. It was now merely an exercise in seeing what numbers were in the spreadsheet for that block and picking those fabric squares. When the top was complete, I offered Erin my opinion on what kind of quilting would look best on this quilt (nothing fancy .. the sheer busy-ness of the top would hide any quilting [see any quilting there? but there is!]) and what kinds of quilting designs to avoid. This was to arm her with some knowledge when she started looking for a quilter. There was absolutely no sense in her being talked into pricey feathered wreaths when such lovely patterns would never been discerned. I also told her that I was improving with my own longarm quilting and should she like me to quilt and bind it, I could certainly do that. Lizzie got loaded with the backing, batting and top ... it darn near took up the entire length of my rollers! And with that, the quilting began! While free-motion quilting with a longarm machine sure gives you LOTS more room to work with than a home sewing machine, you still need to be spatially aware of the quilting density ... how closely are you stitching? I needed to be sure that the large meander remained just that .. that it didn't get bunched up in some areas and too sparse in others. But, in short order, the quilting was done! Woo hoo! The quilt was trimmed, squared and bound with double-fold bias binding. Stick a fork in it cuz it's DONE! woo hoo! All through this project, I was anxious. I kept thinking of all the things that could go wrong. When you are making something for yourself (or for a gift), if Things Happen .. such as the cat barfs on it ... the kids spill red Kool-Aid on it ... you drop your open rotary cutter and slice it ... the iron spits rust marks ... you just Make Do and carry on. But when you are working on a client project, you do NOT have that luxury. You have to produce what was agreed upon and what you promised. My anxiety level was a roller-coaster. Fortunately, the worrying was all for naught ... nothing happened except good things and I am very, very, very happy with the outcome. the binding and mitered corners are *perfect*! I am especially pleased with the corners. The quilt has been bundled up, boxed for mailing and given into the care of the Post Office. Now, I get to worry about safe delivery. oh please, please, please, arrive safely! One reason Erin chose the Disappearing 9 Patch was because it's apparently a contemporary block. I did some research on it and to the best of my ability, this is what I have discovered. Should anyone have further information, I would be pleased to make updates. 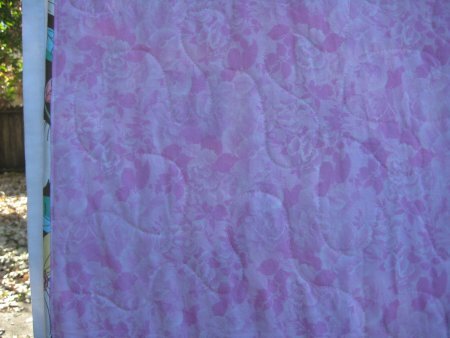 In 2002, Karin Hallaby published her book, "Magic Pillow, Hidden Quilts", (ISBN: 0-9540928-1-3). One block featured in that book is called "Nine Patch Magic". This block is a traditional 9-patch block, which is then sliced vertically and horizontally in half through the center column and row. This results in 4 quadrants. Two diagonally opposed quadrants are then rotated 180�. The 4 quadrants are then re-sewn back together. In essence, the 9 patch has now magically "disappeared". 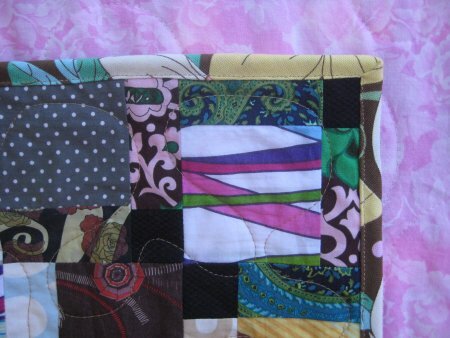 In 2007, Helen Bailey of the UK described this block and posted a tutorial on how she created a quilt using this block on her blog, Quilts and ATCs. Helen told me that while she did call the block "Disappearing 9 Patch", she is not the person who coined the name and she is unaware of who did. Although she knew of Karin Hellaby's book when she made her tutorial, she mentioned that the Yahoo group, Stashbuster, was also discussing it when she joined the group in 2004. Unfortunately, a search of Stashbuster's archive failed to turn up any references to this block, so any discussion there can't be verified. Helen's blog apparently was/is widely read because from that time onwards, every Internet reference to "Disappearing 9 Patch" links to Helen's blog and tutorial and she can be credited with popularizing the name. Since then, the Disappearing 9 Patch block and resultant quilt has proliferated across the quilting community. I have also since become aware of the fact that this block has also been called "9 to 4" but I haven't found a source for that name as yet. This name might be in reference to a 9 patch becoming a 4 patch, but that is pure speculation on my part. 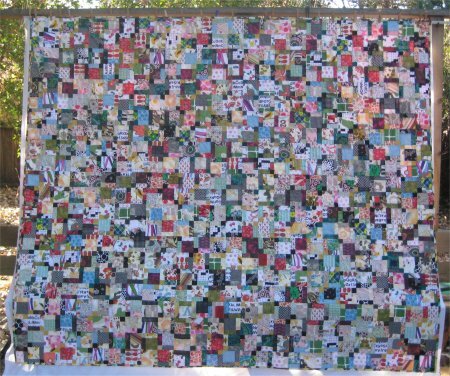 In 2002, Nancy Brenan Daniel wrote a book, "Disappearing Nine Patch Quilts". However, Nancy's blocks and quilts are of an entirely different layout. Karin Hellaby's original block is hugely versatile. 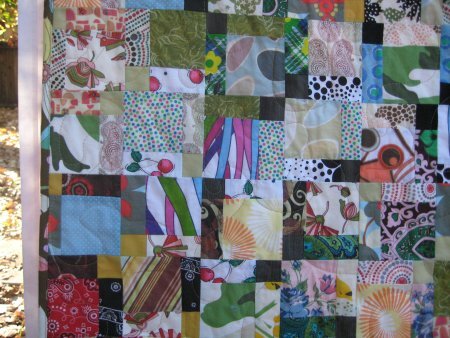 It can be made entirely of scraps, resulting in a quilt of completely random color distribution. If care is taken as to color placement in certain spots, many different patterns can be produced. 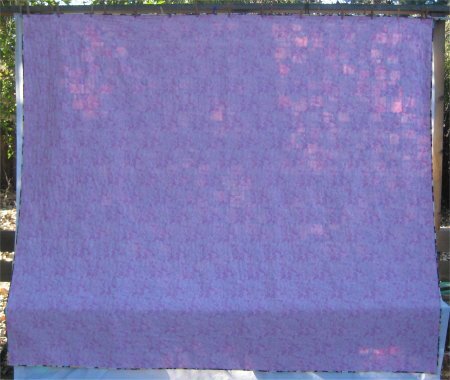 Themed or novelty fabrics can be placed in specific spots so that they are the focus fabric in the resultant quilt. The possibilities are endless and I suspect that no two Disappearing 9 Patch quilts will ever be the same.